Premium addition to the best new social sharing plugin for WordPress. Price starting from 14$/year for a single site. Get awesome social media features for your best social media plugin for WordPress. All that at the speed of light – Social Revolution will not slow down your site. This extension will add a next level of optimizations for your WordPress social sharing buttons. The Pro extension of Social Revolution allows you to decide exactly which image, title and description appears when your content is shared on sites like Facebook and Google+. This also applies to any other networks that use Open Graph data for social shares. On top of that, you can upload a custom Pinterest image. In addition to that, you can also write a custom tweet for when someone clicks on the Twitter button. The exact tweet you wrote will be displayed in the Twitter share box. These capabilities are what professional social media marketers and bloggers have been waiting for. 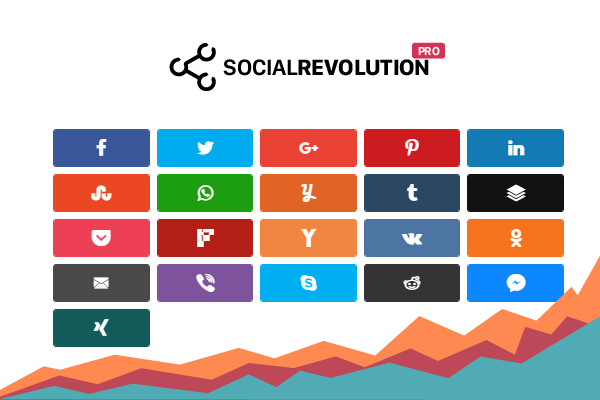 With Pro version of Social Revolution you can fully customize the look of your share buttons. Along with the design customization the free version support you will have access 9 color options and a custom color option. The custom color option allows selection of full color setup based on single network. And you can set a personalized style settings for each display location you are using on your site. Do you want to hide your shares till they reach a specific share value. Pro extension of Social Revolution allows you do that. You can set a minimal display share value for a single networks or/and for totals too. Have you ever changed permalink structures, domain prefixes, connection protocols (http-https) or just flat out changed domains and ended up losing all your social share counts? The build in share recovery feature will restore your shares for all networks when you have made a various URL changes. Do you need to generate short URLs? Social Revolution can do this automatically. With Social Revolution Pro extension you can use the bit.ly, goo.gl, Rebrandly and po.st short URL services. And you also have access to the default WordPress short URL function. Do you want to try for FREE? Download Social Revolution free social sharing plugin for WordPress.